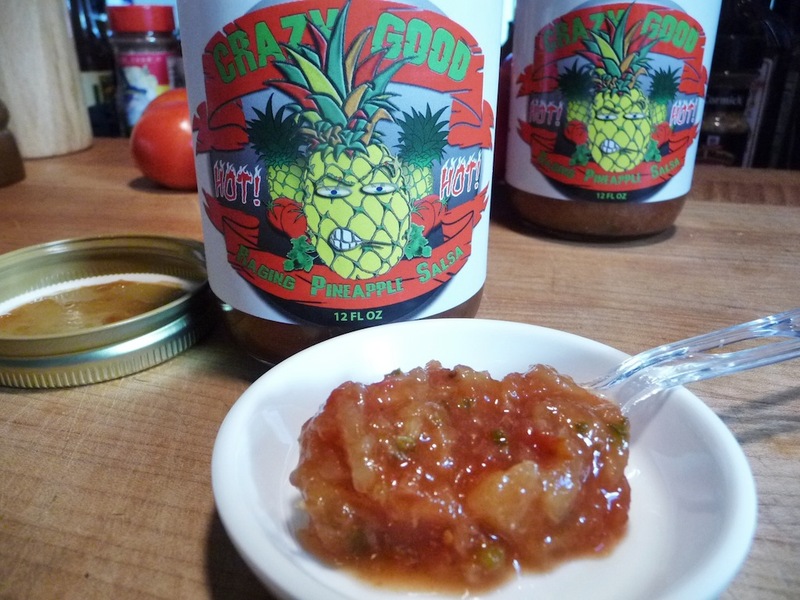 Crazy Good Specialty Foods out of Hernando, MS has just released their Raging Pineapple Hot Salsa. I love anything pineapple – salsas, bbq sauces, glazes, ice cream toppings, yogurt – if it has pineapple in it, I’m all in. 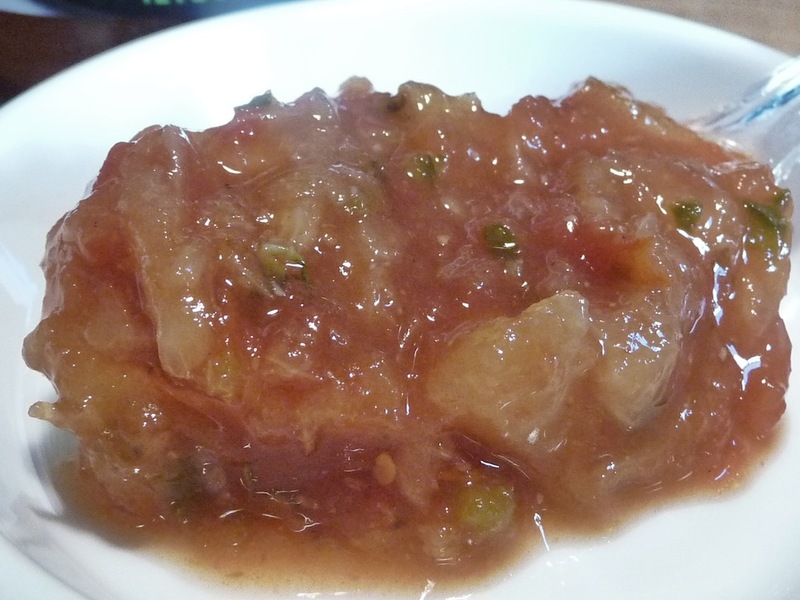 We even posted our own recipe for a quick Pineapple Salsa you can make at home. Let’s see if Crazy Good Raging Pineapple Salsa deserves a spot on my list of good pineapple stuff. Ingredients: pineapple (pineapple, pineapple juice), diced tomatoes (tomatoes, tomato juice, salt), crushed tomato (tomato, salt, citric acid, spices), water, jalapeno peppers, distilled vinegar, poblano peppers, onions, orange habanero peppers, sugar, kosher salt, granulated garlic, natural smoke flavor, xanthan gum. Texture & Appearance: Small chunks in a medium thick sauce, with a nice body and red color. Red? This is pineapple salsa! Where’s the bright yellow pineapple chunks? Well, they’re in there for sure, but with all the tomato ingredients and the jalapeño and poblano peppers, the nice yellow pineapple bits get colored over and lost in the overall look. So, it looks for all the world like your typical salsa. Ok, no biggie. Don’t panic. Taste Straight Up: Out of the jar, a spoonful tastes like tomatoes at first, and garlic and jalapeños. The poblano chiles lend just a little dark flavor followed by the heat of the orange habaneros. Only a hint of the pineapple brings a slight fruit flavor to the mix. Heat Level: – 2.5/5 Right in the middle. Actually, the heat is on the far end of medium, just slightly. Habaneros are the chile that bring on the most heat in this recipe. And it’s a bright, fresh tasting heat. I thought at first, it was quite hot during the first couple of bites. Then I got used to it, and was able to eat more and more. 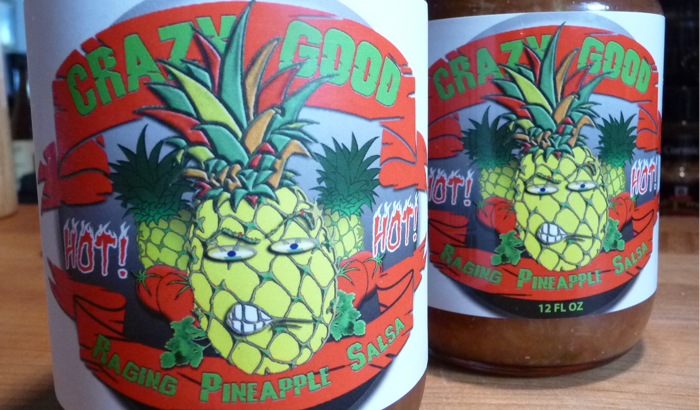 Label/Graphics: There’s an angry pineapple in the center of the label – that’s pretty cool. But most of the other lettering is muted and gets lost in the background colors. I think the fonts and colors could pop a bit more. Taste on Food: Crazy Good recommends serving this salsa “cold for maximum flavor”. So that is how I first tried it with tortilla chips. And it really does bring out all the flavors and heat when you dip a chip into this cold salsa. 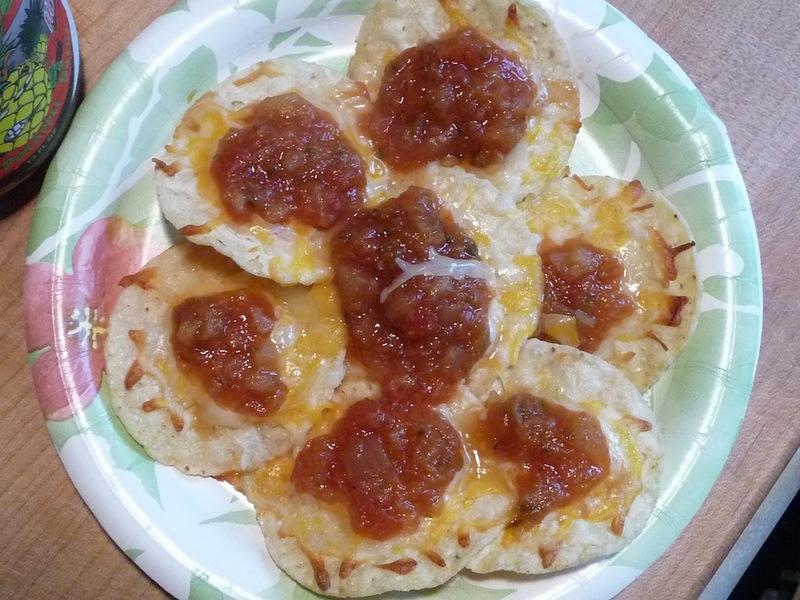 Next, I made a small plate of simple nachos with tortilla chips, 4 cheese shredded, and Raging Pineapple Salsa. I enjoyed the salsa so much more this way. It was gently heated as the cheese melted and the chips got crispy. I preferred this over the straight up / served cold chips and salsa. Finally, and I couldn’t get it out of my head, that this just may make a good pineapple ice cream topping, so I had a few spoonfuls over vanilla ice cream. 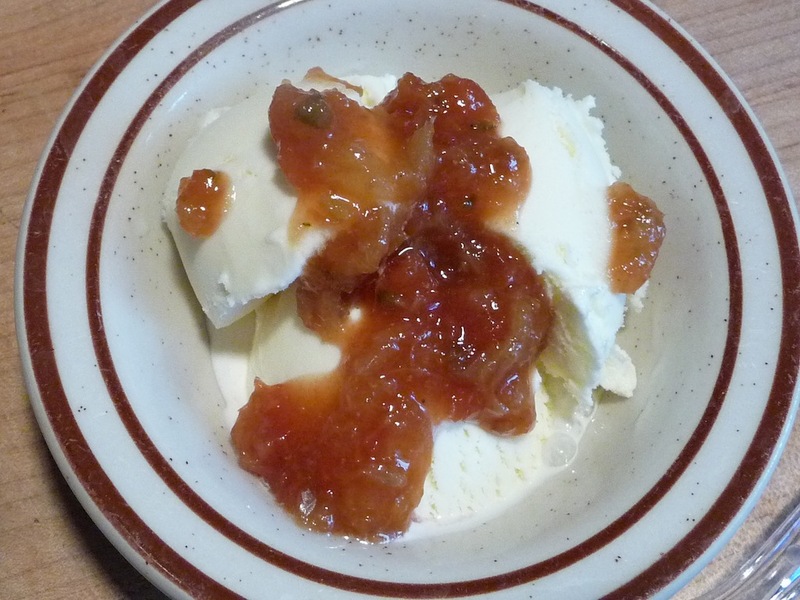 Unless you like tomato salsa on your ice cream. Because when it comes down to it, this IS a tomato based salsa with the addition of pineapple chunks. Then again, you may like it. People put some weird stuff on their ice cream! Overall Rating / Final Thoughts: – I was a little disappointed that the pineapple wasn’t the big flavor player here. This is not the fruity salsa I had expected based on the name. Raging? Yes. Salsa, yes. Pineapple? Just a little. All in all, it’s flavorful from the 3 chiles in the mix – the garlic is fairly present, and the quality of the tomato base is solid. 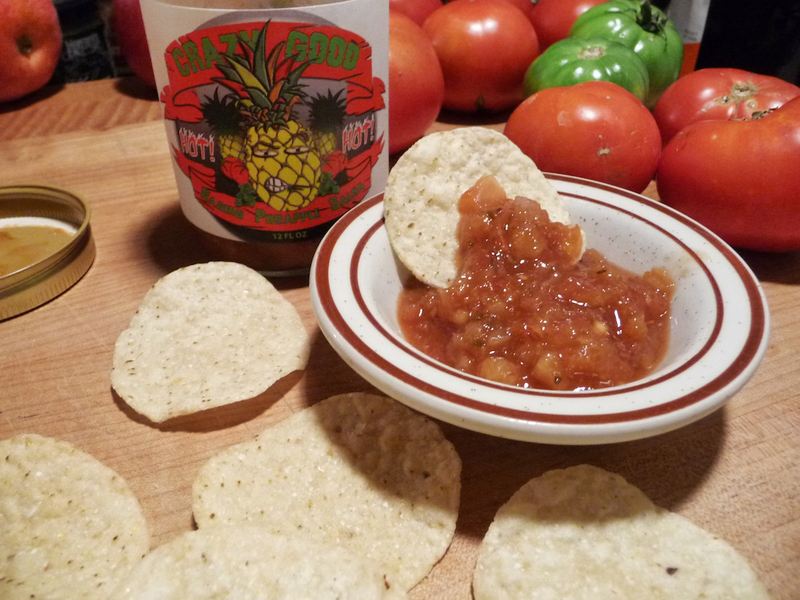 Crazy Good Raging Pineapple Salsa – Hot, is pretty good! It’s just not an over-the-top pineapple mix. 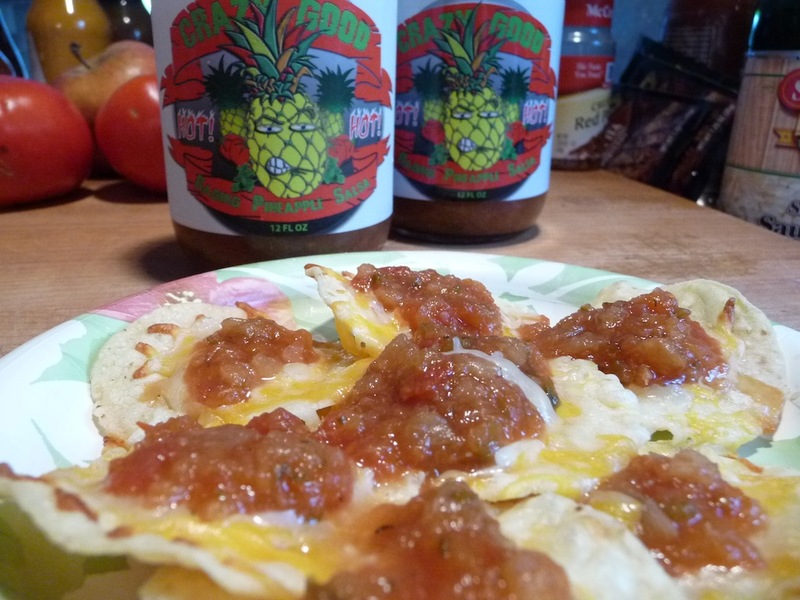 While this salsa will not make my list of favorite pineapple products, it really is a very good, high quality salsa that brings on a nice bite and big flavors. I would be proud to serve it at any party or tailgate. Let’s face it, your friends would be wowed to know it’s a pineapple salsa, without tasting like a sweet pineapple sauce. Yea, people are like that. They like the familiar. Get yourself some, and try it for yourself.